Tailor made & Inspiring Art Workshops. Tailor made and inspiring art workshops set in the beautiful Cambrian Mountains not far from Cardigan Bay. All abilities are welcome from beginners to the more experienced, using your choice of media in a relaxed environment. Tailor made and inspiring art workshops set in the beautiful Cambrian Mountains not far from Cardigan Bay. Watercolour, acrylic, oil and mixed media incorporating inks, pastels, graphite, charcoal etc. We provide the opportunity to work 'en plein air' on fine days in beautiful locations around the farm and surrounding area. We also have a light and airy room for working indoors. 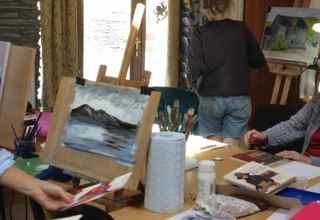 Art workshops are £50 per person per day, £55 with lunch, and can be combined with a stay at Pengwernydd. We start the day with a chat over coffee about the media we will be using and finish with a look at the day's work over a cup of tea and lovely home made cakes. Bring any materials and equipment you have with you. If you are a beginner or require extra materials we can supply them at a small cost. Wear comfortable clothing suitable for painting indoors or out. All tea, coffee and light refreshments are included. Light lunch is available at £5 per person (booked in advance). Please verify availability by telephone prior to booking. A non-returnable deposit of one-third of the total amount is payable on booking. The balance is due on arrival. Provisional bookings are held for seven days pending receipt of deposit. In the event of a cancellation, please inform us under cover of a letter. You are liable for the balance in full, but we shall endeavour to fill your place on the course. Workshop participants are fully responsible for their own equipment and clothing and are responsible for their own safety throughout the workshop. Personal belongings and vehicles are at owner’s risk. All buildings are non-smoking. If this is a personal purchase and you are a UK taxpayer*, Bythynnod Pengwernydd Cottages can increase the value of your purchase without costing you a penny. If you tick the 'Reclaim Gift Aid' box and fill in your full name and home address details, Bythynnod Pengwernydd Cottages will be able to claim at least 25% extra from the Government on top of your purchase made through Guestlink + Web Booking. Your name and address will be forwarded to Bythynnod Pengwernydd Cottages in this case to allow them to claim the Gift Aid. *You must have paid UK tax this year at least equal to the 25% Bythynnod Pengwernydd Cottages will claim.